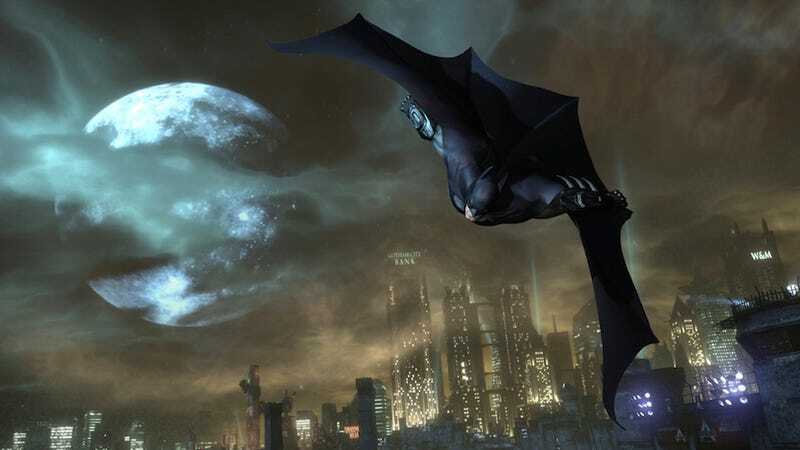 Batman: Arkham City Creator's Next Game Slated For 2014? PLUS MORE GAMING SECRETS AND RUMORS: Troubles at Trion | A Fable Mystery | And... Rockstar comic books? Several agency job postings for an unnamed British developer matching text of Rocksteady career openings says the developer's current project "has been tipped to be one of the most successful games of 2014," suggesting we'll be seeing Rocksteady's next game next year. A widely circulated Variety report from July 2012 claimed Rocksteady's next game was a Silver Age-inspired prequel with an assortment of DC characters that focused on the Caped Crusader's first encounter with the Joker, but those details that roughly match the plot line of the recently released Arkham Origins from WB Montreal. Interestingly, that article has been changed somewhat since its publication: at some point this year, the sentence talking about a 2014 or later release for the next Arkham title became "New game, ‚'Batman: Arkham Origins' bows in November." Given the details matching the recent Arkham release and that sentence change, I'm going to guess the writer was alluding to Arkham Origins, not Rocksteady's next title. But Rocksteady's title is likely another Arkham game. Kevin Conroy, longtime voice of Batman, accidentally let it slip that he was working on a new Arkham title that was not Arkham Origins. Conroy was not voicing Batman in Arkham Origins as it was a prequel, and developers wanted a younger-sounding voice actor; if he were returning to voice Batman, I would think the game might follow Arkham City. With potential back-to-back Arkham games in 2013 and 2014, I also have to wonder if WB wants the series to become annualized. WB Montreal began development on Arkham Origins around Arkham City's fall 2011 release, leaving a two-year development cycle. If WB wanted to target that same gap for WB Montreal's next title, their next title could hit in fall 2015. Earlier this month, Take-Two Interactive, parent company of Rockstar and 2K Games, filed trademark registrations for "Codex," "Carnate" and "Double Take." But there was something quite unusual for video game trademark applications: none of these trademark registrations made any mentions of video games, but rather focused on the likes of printed and digital books, comics and graphic novels. Alongside the trademark applications, Take-Two registered domains that were a bit more explicit at hinting at non-gaming ambitions for the company, including: carnatecomic.com, carnatecomics.com, codexcomic.com, doubletakecomic.com and doubletakepublishing.com. Interestingly, Ruwan Jayatilleke, a former Marvel Comics executive, says on his CV that he has been working at Take-Two since May as a "Business Development Consultant" whose purpose is "Architecting a covert operation." Until this past March, Jayatilleke had served as Senior Vice President and Associate Publisher at Marvel, where he had occupied a number of executive positions. Jayatilleke was also previously responsible for Marvel's adaptations of Halo and Stephen King books. Around the time Jayatilleke began his position at Take-Two in May, he reached out to a few comic book creators — Josh Dysart, Bryan Q. Miller, Robert Venditti and Ed Brubaker — on Twitter to inquire about whether they would be interested in an unnamed project. In one of the tweets, Jayatilleke refers to what he is working on as a "story dev project." Given Jayatilleke's experience in the comic industry, he seems like a likely candidate for helping a video game publisher branch out into the medium. If Take-Two were to start a line of comic books, it would not be the first gaming company to do so: Ubisoft's UbiWorkshop initiative finances and publishes an assortment of Assassin's Creed comics, though if Take-Two is interested from branching from its existing brands, it might suggest the company is interested in original comic book titles unrelated to existing games. Beleaguered MMO publisher Trion Worlds appears to be in further disarray. This month, Keith Winter, who had served as the firm‚Äôs COO, left the company, according to his CV. Winter, a former EA studio chief, was one of two executives Trion found via a headhunting firm; the other, VP of Product Development Nathan Richardsson, left Trion in July. Trion actually also used the same executive search firm to find a VP of Third Party Development in 2011; that employee left Trion in February and subsequently joined Amazon Game Studios as a director. Furthermore, Trion lost its SVP of Technology and Platform and Senior Director of Global Communications this month. And earlier in the year, Trion's SVP of Legal and Business Affairs left for Linden Lab and another VP of Development jumped to EA. In August, following the troubled launch of its $100 million MMO Defiance and several rounds of layoffs, Lars Buttler — Trion's other cofounder — resigned from his position of CEO, and was replaced by Scott Hartsman, a former Trion Chief Creative Officer who left the company earlier at the beginning 2013 to focus on a new startup. It's unknown what lies ahead for Trion, but following the first round of post-Defiance layoffs, Hartsman said, "This model of game making is so fundamentally broken." Finally, Fable Legends might not be the only thing Lionhead has up its sleeves. A recently departed Lionhead staffer says he worked on an "Un-announced project" in addition to Fable Legends following the completion of Fable: The Journey. Lionhead has said Fable Legends "is the only core Fable game in development," and a Fable IV is not presently in the cards. But I feel inclined to guess that Lionhead could be fiddling with a "non-core" Fable game — something more ancillary like Fable II Pub Games or Fable Heroes.